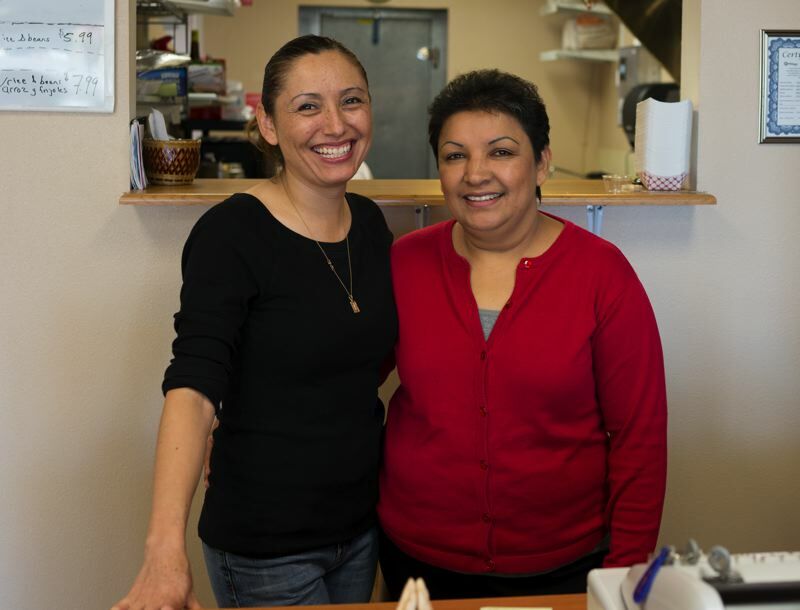 Carolina Tapia and Maria Calderon had a dream: to own a thriving, authentic Mexican restaurant. With the recent opening of A Taste of Mexico in Hillsboro, their dream is on its way to being fulfilled, but the journey has not been easy. PHOTO: CHASE ALLGOOD – A Taste of Mexico is now open on Southwest Cornelius Pass Road in Hillsboro. Owner-operators are Carolina Tapia and Maria Calderon. Carolina was born in the United States, but grew up in the barely-there town of San Jose del Vergel in central Mexico. She left school after the sixth grade to help at her father’s grocery store. At 17, she embarked on a pilgrimage to a better life in Oregon, where two of her brothers lived. Because her mother had been born in Colorado, her American citizenship was secure, but her future was not. Determined to flourish in her new home, Carolina learned fluent English through immersion in the American culture, and at 19 she earned her GED. Over the next 12 years she worked for several Hillsboro manufacturing companies, including Intel and White Electronics, where, 10 years ago, she met Maria. Maria was born in Morelia, Michoacan in southern Mexico and grew up as one of 10 children in an impoverished family. Finishing school in the ninth grade and married at 15, she became the mother of three children in the next four years. At 19, she and her family slipped across the U.S. border at Tijuana and headed to Oregon. Maria spent her first five years in the U.S. toiling under the sun in Oregon’s fields, before shifting to a cabinet-making company and several manufacturers in the Hillsboro area, including White Electronics. In the meantime, she became a proud U.S. citizen in 1988, following the passage of federal immigration reform legislation in 1986. “After 30 years here, I feel like this is my house, my home,” she said. About a year ago, Maria took a trip to Mexico where she saw a number of small restaurants that seemed to be doing well. When she came home, she pitched to Carolina the idea of starting a little eatery featuring all fresh authentic Mexican food. They leased space at 3002 S.W. Cornelius Pass Road, just off TV Highway in Hillsboro, and figured all would go smoothly. They weren’t prepared when bills came in to upgrade the plumbing or re-do the walls and floors of the leased space. They weren’t prepared for all the government requirements, each with its own fee. They weren’t prepared for the multiple government inspections and dealing with the city bureaucracy. A Taste of Mexico finally opened on Aug. 5 with a cramped kitchen, six tables and three booths squeezed into 960 square feet. After about two months in business, Carolina and Maria are still struggling, but more customers are coming in with each passing week and they’re increasingly hopeful. If we want people to be at work instead of on welfare, small initiatives can make a big difference. To make things worse, the loan had a punishing interest rate of about 35 percent, translating into initial monthly payments of $390 … which rose to $426.98 when she missed some payments. Emelia Moreno (not her real name) is a single mother who grew up in south central Los Angeles and now works for a social services agency in Hillsboro. In the beginning, she figured she could handle the monthly payments on her car, but eventually they overwhelmed her. Compounding her troubles, she was caring for a daughter born with heart problem who required continuing medical care involving specialists and an extensive regimen of drugs. “I got to a point where I just couldn’t make it, where I wanted to say, ‘OK, take my car. I just can’t make the payment anymore,’” Moreno said. That was when a co-worker told Moreno about the “Ways to Work” program under the umbrella of Portland-based nonprofit called Metropolitan Family Service. The program helps low- and moderate-income individuals buy, refinance or repair cars with loans at reasonable rates. According to the Urban Institute, families without cars often find it difficult to find a good job, get to work and stay in the work force — particularly in spread out suburbs. People without vehicles also have problems meeting their family’s needs, such as getting to and from medical appointments and childcare facilities and dealing with emergencies. Transportation difficulties may also limit where people look for or consider working. It is to Hillsboro’s economic advantage, therefore, that residents have access to cars. Moreno took her first step toward car contentment by scheduling a meeting with Abby Wood, Ways to Work’s program coordinator. Wood told Moreno to bring her current $9,000 loan balance down to $8,000 (all Ways to Work would refinance) and to draw up a budget. When Moreno finally whittled down her existing loan, Ways to Work offered to refinance her car with an $8,000 loan at 8 percent, repayable at $150 a month. So far, Moreno is another success story for Ways to Work. In other situations, such as when clients seek a loan to buy a used car, Ways to Work teaches them how to do it. The Ways to Work program offers loans of up to $8,000 at 8 percent interest. The result is more than $1 million in loans to community members in Oregon and southwest Washington since the program began in 2004; a low payment delinquency rate of less than 10 percent; and a default rate of less than 4 percent.